I recently commented on an Amazon customer review of an HP toner cartridge we use here at the office. The user was considering buying a refilled toner cartridge due to cost savings. I gave him a speech on it (not trolling! Just providing perspective). Here’s an edited version of what I wrote. Geez, I sound arrogant. I agree that the cost is high, but I would point out that the reason I buy HP printers is that, as an IT technician, I know I can rely on them, and I won’t go wrong recommending them to a customer. Their quality is unmatched by anyone in the industry. They build better products, so they are more expensive. Of course, it’s your call what you want to buy, but I wanted to give the “standard” IT guy line on why to buy new instead of refilled. 1. Reliability – it is fairly common knowledge in the IT tech field that refilled toner cartridges are not reliable. Cartridges were not made to be refilled, regardless of what may be posted on refill-kit websites. See http://www.hp.com/sbso/product/supplies/toner-cartridge-refill.html for more information. In addition, you may not save money if you get a faulty cartridge, and you may not be able to return any of the refill-related parts (for instance, tonerrefillcartridges.com states: “All defective returns examined and weighed. Product that is found to be non-defective or used will not be credited.”) So if you used it a few times, then it spilled toner, you may not get a refund? Shipping fees are non-refundable (that would typically include return shipping), so you might pay more in shipping than you did for the cartridge. 2. Health – Toner is considered by some scientists to be a carcinogen (http://news.zdnet.com/2100-9584_22-157835.html). It suspends easily in air and is easily inhaled. Refilled cartridges have been known to spill toner more frequently than new cartridges, increasing the danger. Some manufacturers claim this is an urban legend (of course they would! ), but some researchers insist toner is dangerous. It can also be a pain to clean up because it is static-sensitive and clings to plastic surfaces such as the inside of the printer. 3. Quality – since refilled ink and toner is designed to lower the price as much as possible, the quality of ink and manufacturing is often questionable (again, see website from #1). If it’s the environment you are concerned about (as refill companies will tell you you are being “green” by refilling), check your local area for a computer recycling center. Many metro areas have a computer store that will recycle cartridges or equipment. If not, check with the manufacturer. Bottom line for me is – if I’m a home user who prints mainly for personal use (i.e. doesn’t need resume-quality documents or color documents), and it’s not important if my printer is unavailable a few days in case of a cartridge failing, then I might use refills. If I’m a business user and need 24/7 reliability and high quality printing on the first try (especially in color printers), it would be worth it in the long run to go with a new cartridge. It’s your call, of course, and I might go with a refill cartridge for home use, but I wouldn’t expect to save as much money as it appears upon first glance. First on the list! That’s a first for me. 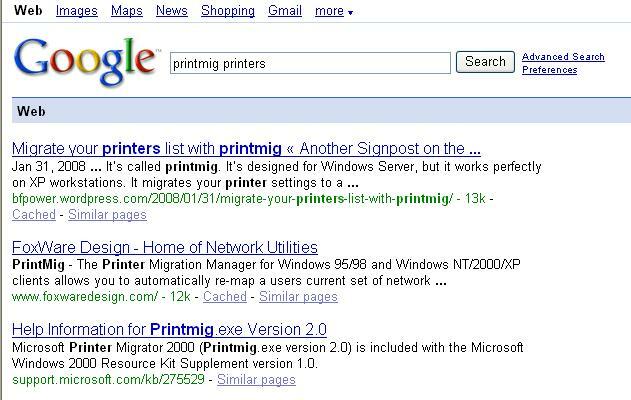 I was checking out my blog stats, and saw that someone found my post on printmig through a Google search for “printmig printers.” So I had to see where I came up on the list. Actually, I came up second! I was surprised that I came up even higher than the MS site you can download it from. So my wife and I were visiting tonight about the blog, and we checked Google again, and – lo and behold, this little tiny blog comes up first for that search now! Keep up the clicks! I think that continually learning and growing is the mark of a great IT pro. In light of that, today I stumbled across a find I won’t forget. This may be old news to some of you, but if you’re like me, you’ve sometimes spent your time working harder instead of smarter. Here’s the smarter. It’s called printmig. It’s designed for Windows Server, but it works perfectly on XP workstations. It migrates your printer settings to a new machines. At our office, we have about 15 printers set up on our network. We don’t use a print server (for very good reasons due to the nature of our business). The problem is, every time I have developed a new image (we have about 5 models of PC out there on the floor, plus at least 3 models of laptop) or edited an old image, I have entered all the printers manually, creating a TCP/IP port, loading drivers, etc. No longer do I have to do this. Printmig allows you to save your entire printer configuration as a .cab file and load it directly onto another machine. One caveat – you need to make sure any specialty printers (app-specific faxes, Adobe Distiller, etc) have the appropriate program installed before you copy the printers over (I am already accustomed to adding printers after programs in my image dev process, so no loss here). One of my rules in tech support is that “if you’re having a problem with it, someone else probably has too.” So if you’re like me, here’s a little something to help you in your image development. Enjoy. So tell me what you think! Have you used other printer migration software? I’d love to hear about it.